In PowerPoint Online, you can do basic background formatting of one or more slides with a solid color or a picture. To do more advanced formatting, such as adding a color gradient or making a picture transparent, use the desktop version of the PowerPoint app on Windows or macOS. On the Design tab, select Format Background. Select Solid Fill, and pick a color from the gallery. Note: To reset the background to its previous state, on the Home tab, select Undo . If you want to have all slides have this same background color, on the Design tab, select Format Background > Apply to All. 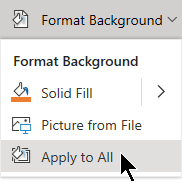 When you insert a picture as a background, PowerPoint Online resizes the image as best as it can to fill the entire area of the slide. For best results, choose a picture that has the same orientation as your slides. To make all slides have this same background picture, on the Design tab, tap or click Format Background, and tap or click Apply to All. PowerPoint Online supports the following picture formats: .jpg, .jpeg, .png, .gif, .bmp, .wmf, .emf, .tif, and .tiff. PowerPoint Online doesn't have the ability to make a picture transparent. Use the desktop PowerPoint app if you want to make a background picture transparent. If you have just added a background picture or color and decided not to use it, you can remove it by using Undo on the Home tab of the ribbon. On the Design tab, tap or click Format Background. Tap or click Solid Fill, and pick White, Background 1 at the top left corner of the color picker. 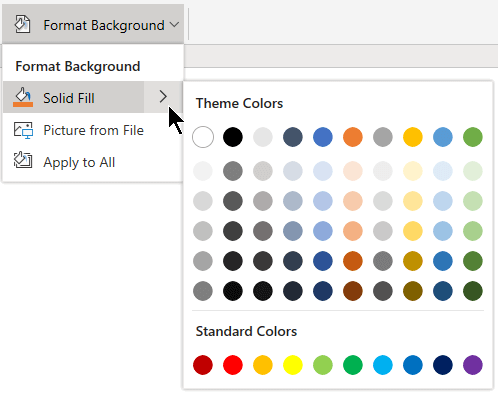 PowerPoint Online comes with themes—sets of professionally designed colors, layouts, and fonts. After you select a theme, all your slides will adopt that look. For more information, see Apply a colorful theme to your presentation.